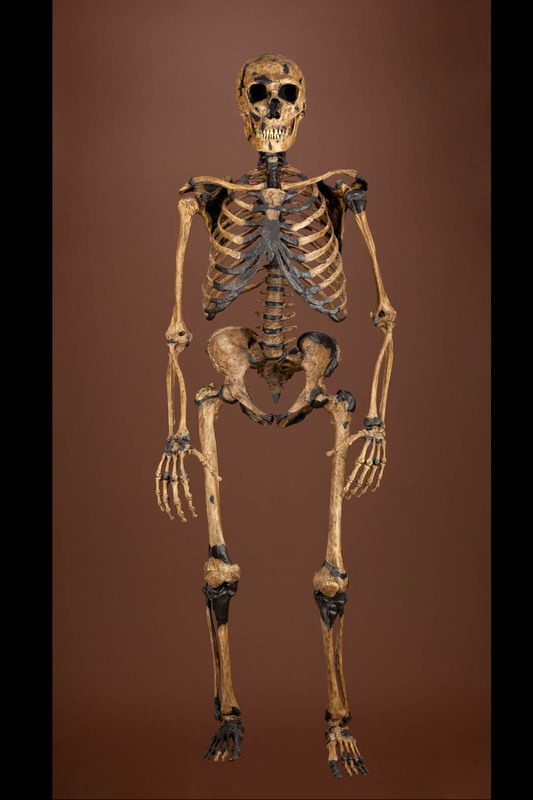 The earliest human species were small in size and usually had long arms and short legs. Their plant-based diet required a large digestive tract. A wide rib cage made room for the stomach, intestines, and other organs that break down food. As some early humans adapted to hot climates, they evolved narrow bodies that helped them stay cool. Long legs enabled them to travel longer distances. Eating meat and other foods that could be digested quickly led to a smaller digestive tract, making more energy available for tall bodies and large brains. When early humans spread to colder climates, their body shapes evolved in ways that helped them stay warm. Short, wide bodies conserved heat. Early humans continued to depend on both raw meat and cooked food, both of which could be efficiently processed in a short digestive tract. 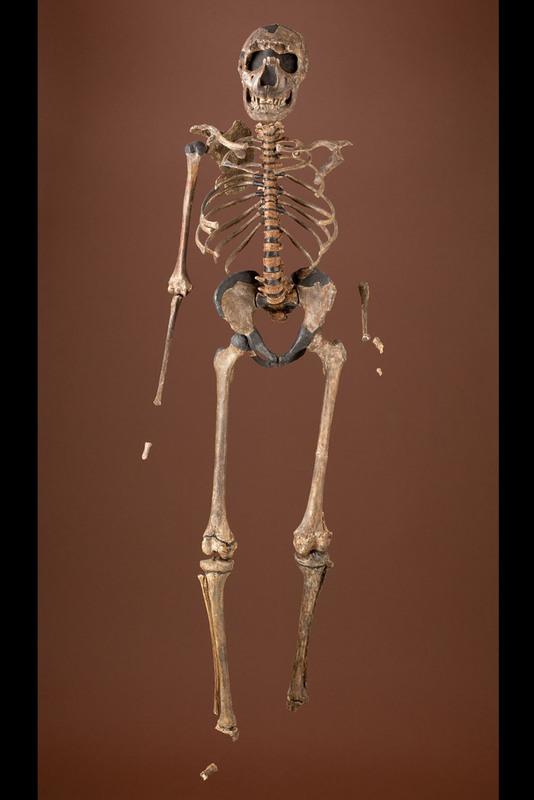 This is the skeleton of an eight- to nine-year-old Homo erectus boy who lived in East Africa about 1.6 million years ago. The pelvis shows he was male. His teeth tell his age. The boy was 1.6 m (5 ft 3 in) tall and weighed 48 kg (106 lb). If he had reached adulthood, he might have grown to nearly 1.85 m (6 ft). His tall, lean body was well adapted to hot, dry environments. Notice the narrow pelvis of this species. The slender body shape helped keep the body cool, a big advantage in hot climates. The lower legs of Homo erectus were long, a feature that helped dissipate heat. This Homo erectus boy lived in a hot, dry part of East Africa near an ancient marsh. His species was one of the first to spread beyond Africa, where it encountered a variety of environments. An average adult male Neanderthal stood only about 1.63 m (5 ft 4 in) tall. That’s not much taller than the skeleton of the eight- to nine-year-old Homo erectus boy at right. Neanderthals of Europe, who had evolved by about 200,000 years ago, had to endure winter cold and even ice ages. Their short, broad bodies were well adapted to these challenging climates. A short, broad body shape helps to retain heat, which is useful in cold environments like those inhabited by Neanderthals. The lower leg bones in this Neanderthal skeleton are short compared to the upper leg bones, a feature that reduced heat loss. Compare them with those of the Homo erectus skeleton at left. 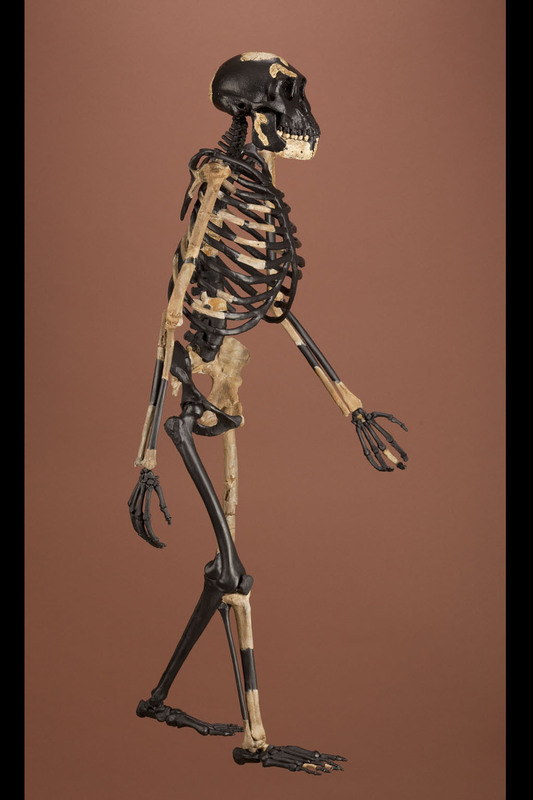 This reconstructed skeleton includes parts of two Neanderthal individuals from different times and places. One individual lived in western Europe 70,000 years ago. The other inhabited a cave in what is now Israel 60,000 years ago. Both sites were cold and dry, like most of the places where Neanderthals lived. As early humans spread to different environments, they evolved body shapes that helped them survive in hot and cold climates. Changing diets also led to changes in body shape. The bodies of early humans were adapted to very active lifestyles. Their bones were thicker and stronger than ours. Starting about 50,000 years ago, as a result of less physically demanding lifestyles, humans evolved bones that were sleeker and weaker. Early humans ate mainly plants, which take a longer time to digest than meat does. Long digestive tracts helped process this food. Modern humans eat a diet that includes meat and cooked foods. We can process these foods efficiently with a shorter digestive tract.